Oh, one important thing. I hope, I don't have to explain how to use a needle. 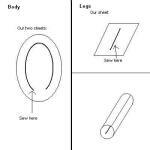 The body consists of 2 ellipses which have a lengh of 20 centimeters and a width of 15 centimeters. After you've cut them out (before cutting, draw them with the pen), put them together and sew their borders together. Don't sew the complete border, let a small opening (like visualised on the first picture). Now, do the same you do with your socks. Pull it through the hole to "take it on the otherside". Finally, write "DRAGON" on it and you're done. We'll need 4 pieces, each rectangular, with a length of 14 and a height of about 8,5 centimeters. Take each piece and crumple it 3 times. 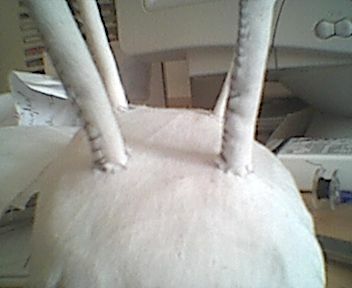 Then, sew it , directly through the middle (take a look at the first picture). 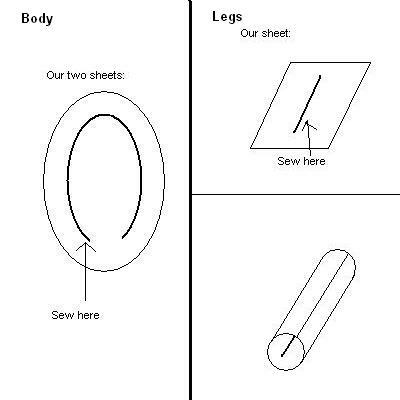 After you've done that, crumple it again and sew the both borders together, so it looks like a small pipe. If you haven't done anything wrong, your pipe has still a length of 8,5 centimeters. Now, you can pull the fibre you've used in the previous step out and the leg is done. When you're done, your parts should look like on the second picture. Now, let's complete the dragon. 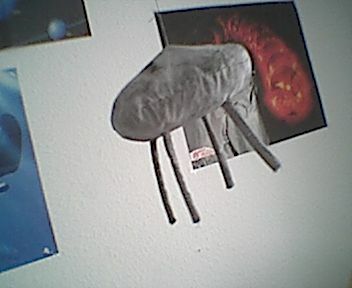 Ok, the tricky part begins, the attachment of the legs. You may take a look at the third picture, but I regret, it doesn't visualize it well... Well, you basically pull the needle through the leg (near the end, of course), then you pull it through the stomach, where the leg is supposed to be and through the leg again. After some swearing (or talking with god or your cat), you're went around the leg and should fix the fibre (or make another round, if you want). 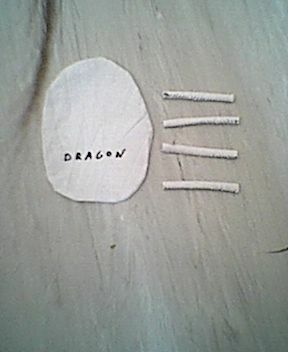 Since I used an old sheet, the dragon is white now. 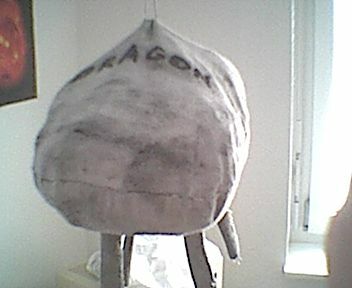 May be funny, I, personally, don't like white, so I painted it grey (like the HQA dragon). Erm, stop. Before painting, you could pull another fibre trough the dragon's spine, to hang it somewhere. Why? I painted it with water colors, that need time to dry. With this ultimate solution, the dragon could hang around, while drying (and posing for the pictures).